Palmer, whose career spanned more than six decades, is considered one of the greatest professional golfers in the sport’s history, having won 62 PGA titles during his career. Arnie’s Army, a charitable organization Palmer started to help children, along with Stonewall Resort will kick off the “Life Well Played” Challenge at the event. “Join us as we celebrate everything that made Palmer a beloved sports icon – from his bold yet unassuming charm to his overwhelming drive to help his fellow man – by showcasing how you’re making a positive impact in the lives of those around you,” said Stonewall’s PGA Golf Professional Randy Hernly. The event will begin at 11 a.m. with a shotgun start. 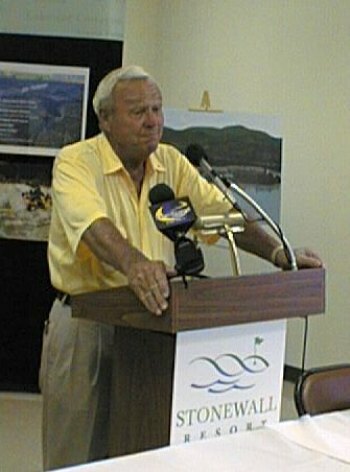 Hernly will welcome participants and explain what Palmer meant to Stonewall Resort and the legacy he left in north central West Virginia. The cost to participate for each person is $60 and includes lunch and range and green fees. Birthday cake will be provided, and prizes will be awarded. The event is limited to the first 60 entrants. Registration is required and can be made by contacting the Golf Shop at (304) 269-8885 or visit www.stonewallresort.com. For more information about the “Life Well Played” Challenge, visit www.arniesarmy.org.